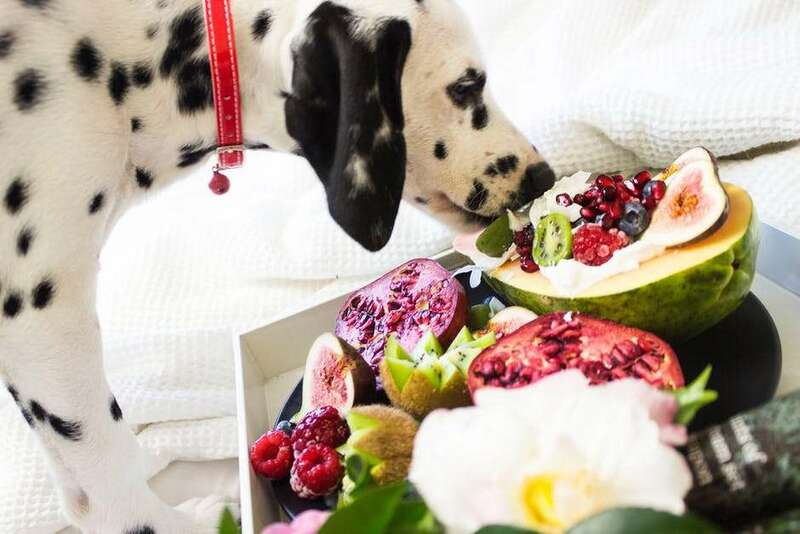 From raw food diet to foods to avoid, Sydney Wide Pet Doors created this puppy food guide to help you choose the best puppy food for your four-legged friend. Anything that’s small and young needs proper care and nutrition to grow and be healthy. Puppies are no different. If you want your puppy to build strong bones and teeth, develop muscle, and have energy for play, proper nutrition is essential. But what is the best puppy food for your fluff ball? How do you choose the best meal plan? Let’s dive into the most commonly asked questions by puppy owners and find out! What to Feed my Puppy? The best way to know what’s the best puppy diet for your dog is by asking your veterinarian. Asking your vet for recommendation is the smartest way to know what nutrients your puppy needs. Your vet has experience with different puppy diets and they’ll be able to recommend the best one. What to Feed a 8-Week Old Puppy? During the first 6-8 weeks, the puppy should stay with the mother to nurse ad-lib. The mother’s milk provides the best nutrition, as well as antibodies that protect the puppy from various diseases. If the mommy is not present or if has a certain disease, you can get milk replacers and bottles that are designed for this specific situation. You can find them in any pet store. When Can a Puppy Start Eating Solid Food? Introducing your puppy to solid food should happen gradually. When he’s about four or six weeks of age, begin by mixing the puppy food with milk replacer. Give him the mix three to four times a day and gradually reduce the amount of milk. By around 8 weeks of age, your puppy should be eating solid food. The brand of puppy food should be high quality and contain all the caloric and nutritional properties your puppy needs. You can discuss the brand of puppy food with your veterinarian. Their recommendation will likely be puppy food that’s a great source of calcium, protein, and calories. How Many Times a Day Can My Puppy Eat? The best puppy feeding schedule is eating three times a day until your puppy is four to six months old. After that, eating twice a day is enough. While they’re young, puppies need a lot of calories so that they can grow. 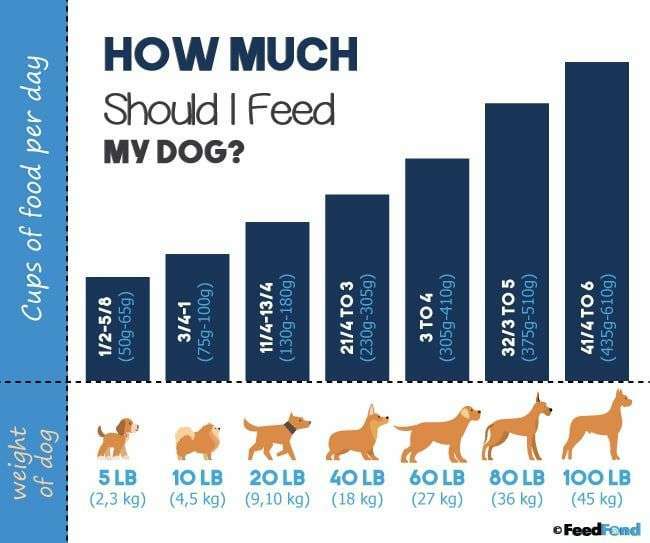 How much food they need depends on their size, age and breed.You should check the feeding chart that’s on the package of his dry puppy food. 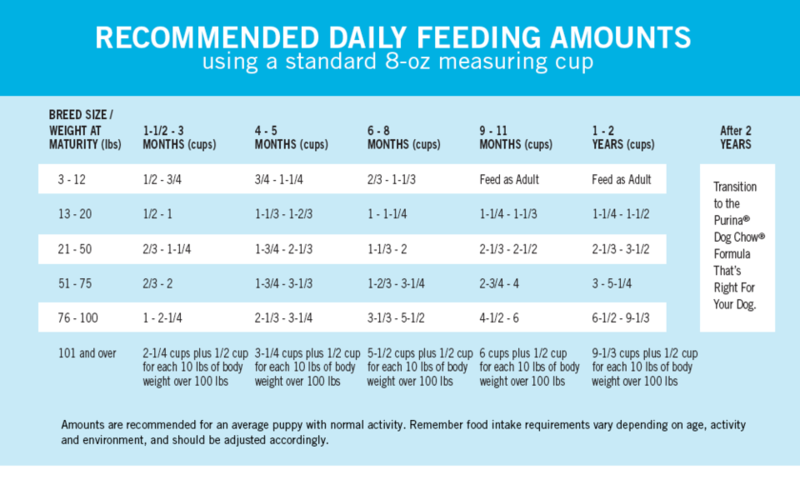 Look at the chart that contains daily feeding recommendations and divide that amount by four. What’s the Best Raw Food Diet for Puppies? Over the past several years, raw dog food diet has gained popularity. Why? A growing number of veterinary associations and nutritionists point to the dangers of feeding your dog processed foods that contain addictive ingredients. Introduce one source of protein at a time. Start with chicken or turkey meat and feed your dog your first source of protein for a week. Once you see that there are no signs of a digestive issue, introduce your second source of protein. Feed your puppy three times a day. Feed your puppy three times a day until he reaches 6 months. After that, feeding him two times a day will suffice. Balance their calcium and phosphorus intake. The raw dog diet should be half to two-thirds meaty bones and a half to one-third meats and offal. Feeding bones to puppies is a no-no. Make sure you remove the meat from the bone before feeding it to your puppy. Bones can be life-threatening to puppies as they can choke on them or get a puncture in their digestive tract. Can Puppies Eat Cooked Chicken? Cooked chicken is a safe food option for puppies. It’s healthy, it’s safe and it contains good amounts of protein to stimulate your puppy’s growth. You can feed your puppy chicken on its own or you can mix it with another type of food. Make sure you remove the bone from the chicken as your puppy can choke. Also, avoid feeding your puppy raw chicken meat as it can cause a Salmonella infection. Can Puppies Eat Raw Lamb Meat? Although cooked lamb is a healthy protein for your dog, raw lamb is not a recommended puppy food. Just like with raw chicken meat, raw lamb meat puts your puppy at risk for Salmonella or E.coli. Raw meat is also not advised for dogs with liver or kidney failure. You’ve probably noticed how dogs come trotting when you put prepare your tuna fish sandwich. If you’re tempted to share your food with him, you can! However, make sure you feed him tuna meat occasionally and in small quantities. Tuna meat has high levels of mercury and canned tuna contains more sodium than your puppy needs. What’s more, puppies also suffer from gastrointestinal issues when they eat food they’re not used to. If you notice than your puppy vomits or has diarrhea after he eats tuna meat, eliminate the tuna from your puppy food diet list. 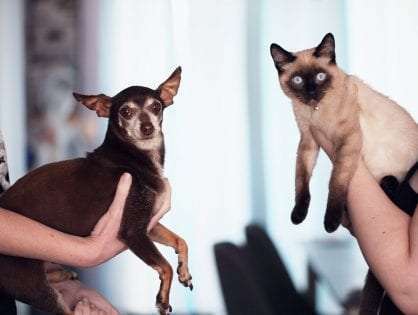 Is Kangaroo Meat Good for Puppies? The best things about kangaroo meat is that is high in protein but low in fat. This type of meat is particularly good for puppies with digestive troubles. The low fat meat is easy to digest and doesn’t cause any problems with their gastrointestinal tract. Kangaroo meat is clean and valuable meat for your puppy. 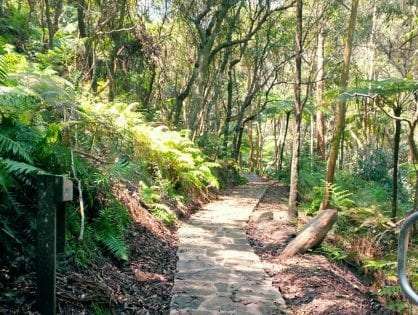 Kangaroos are not farmed and that makes the meat truly free range, and organic. All in all, the decision to include kangaroo meat to your puppy’s diet depends entirely on you. Your dog can safely eat raw and cooked carrots. They are an excellent food choice for your puppy as they’re low in calories and a great source of vitamins, fiber, and minerals. If you’re looking for a healthy snack to include to your puppy diet, carrots are a great option. Make sure you cut the carrots in small, bite-size pieces so that your puppy doesn’t choke while eating them. When Should I Switch from Puppy Food to Adult Food? If you have a small-size dog, he’ll be ready to transition to adult food diet when he’s 9 to 12 months of age. He should weight 20 pounds or 9 kilograms when he’s fully grown. If you have a medium-breed dog, you should make the transition when he’s 12 to 14 months of age. He should weight between 20 and 50 pounds, or 9 to 23 kilograms when he’s fully grown. Large-breed dogs should make the transition when they’re between 12 and 24 months old. They weight more than 50 pounds or 23 kilograms when they’re fully grown. What Foods Should My Puppy Avoid? How’s your puppy’s diet like? Tell us all about it in the comments. Also, as a bonus check at these very healthy homemade dog food recipes.